I hate art auctions. Not just because they’re freak-show legal casinos, spectacles where the Über-ultrarich can act out as profligately in public as possible, trying to buy immortality, become a part of art history, make headlines, and create profit. I don’t only hate them because they may be the whitest sector in the entire world. I hate them for what they do to art, for the bad magic of making mysterious powerful things turn into numbers. Many asked why The Scream would go for this much money. Who the hell knows how these things happen? I’d say the image is utterly iconic, as recognizable as the Mona Lisa or Whistler’s mother (or Damien Hirst’s shark). It looks and sounds and smells like the cusp of the nineteenth and twentieth centuries. It says, “I am a new psychology—your psychology.” The Scream has attained fridge-magnet status, and anyone who looks at it can at least say, “This is art-historical art.” I love The Scream because it shows Munch being modern without being Cubist, inventing Expressionism, exploring new ideas about color, composition, culture, society, cities, nature, drawing, and touch. We see a figure between worlds, suspended between earth and the unknown, wide-eyed, unable to hear us because his hands block his ears, even as he opens his mouth in a scream he can’t hear himself. This is being inside and outside at the same time. The sky lights up; alienation blazes. It’s fabulous and prophetic. And, now, gone again. Auction houses run a rigged game. They know exactly how many people will be bidding on a work and exactly who they are. In a gallery, works of art need only one person who wants to pay for them. Auctions jigger the rules in one tiny way: They have two people who want something, and they know how high each is willing to go. The setup is simple and perfect. The auctioneer simply waits until he gets around the ceiling he knows these two clients are willing to go to; then he pits the two bidders against one another. Voilà! Money. Last night, Meyer knew that two people were ready to surpass $100 million. He got them there, said he had “all the time in the world,” kept them going up, waited for one to blink, and banged his gavel. Doing this publicly instead of in private just means that more people see what happened and want to try playing the game (not knowing or not caring that it’s rigged). It’s advertising for the next auction: Whole new client markets open, and entirely new material now lures these players in. Now other Expressionist works at lesser prices will be put into play. And I’ll end up on the Charlie Rose morning show again, this time grousing about how much a Max Beckman is going to go for. The bad magic here is that people can no longer see this work as a painting. Now people look at The Scream or Van Gogh’s Irises or a Picasso and see its new content: money. 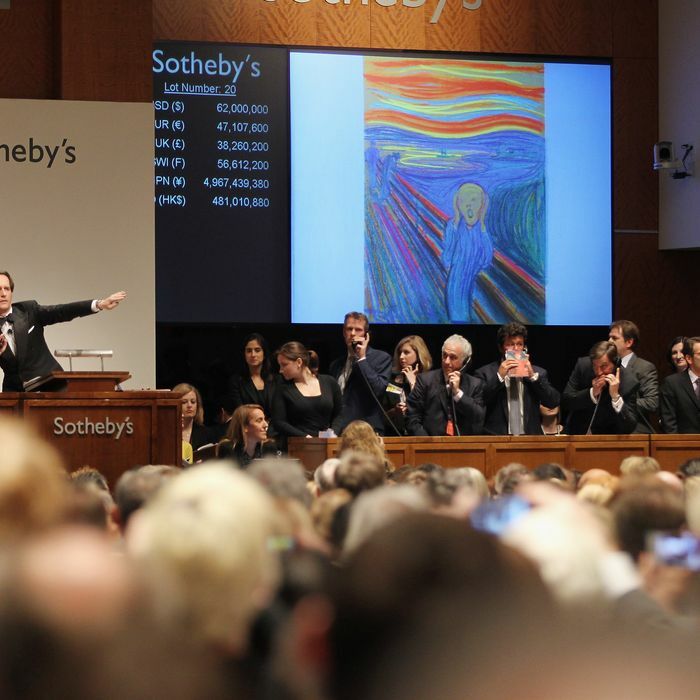 Auction houses inherently equate capital with value. The price of a work of art has nothing to do with what the work of art is, can do, or is worth on an existential, alchemical level. The closest I come to wanting out of contemporary art is when I look at the auction trade. A pox on their houses.